The gift I gave Jon for our anniversary was not an expensive one, but a sentimental one. I had all kinds of ideas about getting him an engraved piece of jewelry, but he's just not a jewelry kind of guy. I racked my brain trying to think of what to do, and then remembered a Pinterest project I had pinned awhile back! The original tutorial from Jesse at Scout and Nimble can be found here. 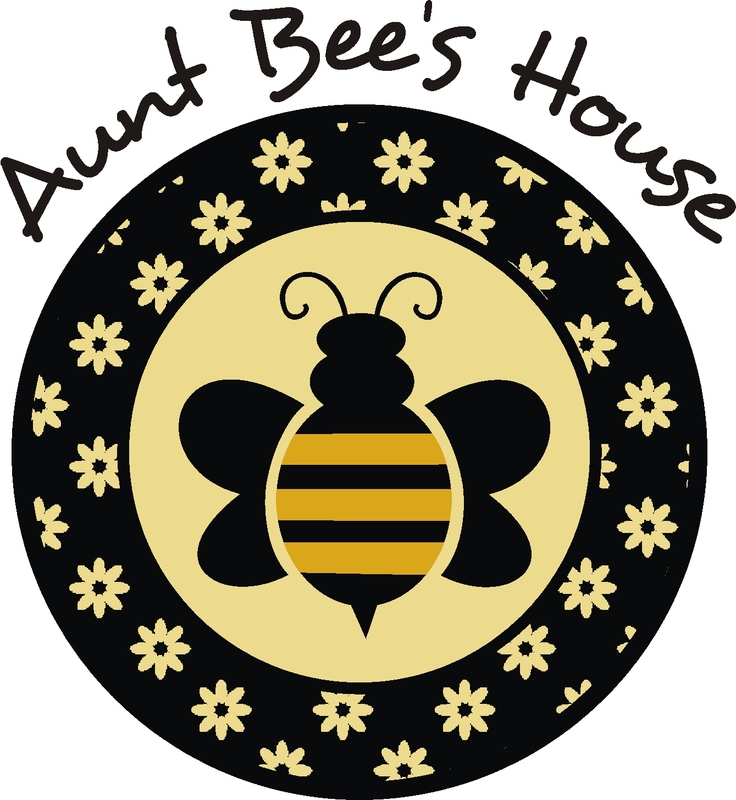 She does a very thorough job of explaining all the details of putting the project together, so I won't try and replicate the great job she did there. I will throw in my own info on how my project came together, since I tweaked a couple things. 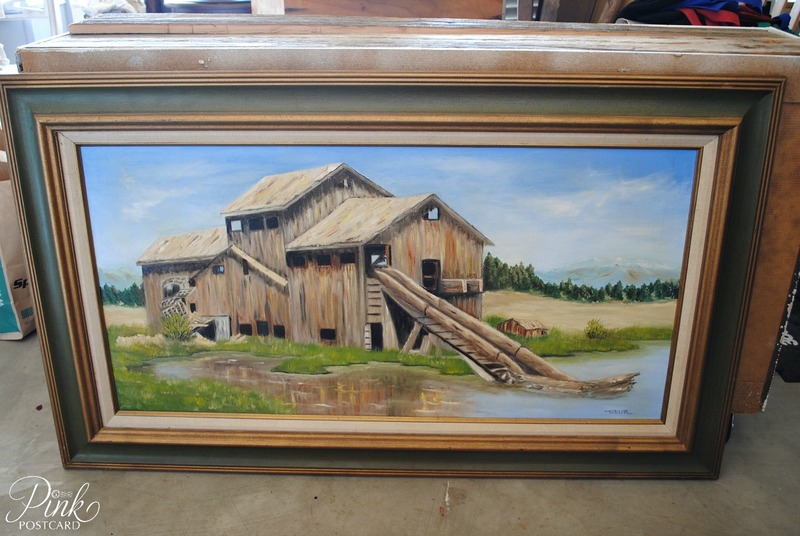 First off, I found this painting at a thrift store. I paid under $5 for it, because it was 75% off. It was a good size, and the frame was really nice. 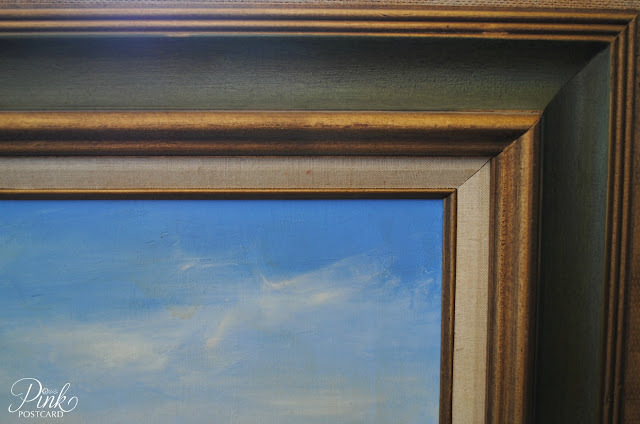 I wanted to make sure I had the dimensions of the frame I was using, so I knew what size to get for my canvas. And then I had a "duh" moment. Just use the existing canvas! The inset of the frame was green, but I just broke out the black paint. Next, I went to Sheet Music Plus, and purchased a copy of the music I wanted. The price was $3.99 for me to get it. You pay for each print, so as Jesse pointed out, make sure you are ready to have it go through your printer or you will be paying again to download your music! Once I had the music printed off, I cut it into strips so the lyrics would lay out the way it would read on a large scale print. It took a bit of time, but you really want to have it read all the way across, and not in short up and down sections. I went into Fed Ex Office to have it printed. They will do oversize prints like you would see for drafting jobs. Initially the people I worked with were helpful, but the lady who finally did the actual print job was not very nice. I don't think customer service was her thing. "you can't photocopy that because it's copyrighted". I did get hassled initially, but I pointed out that I had purchased the rights to the copy I had. It may take you finding a few places that will be willing to do the copy for you, so if you have little ones in tow, or are in a hurry, allow for extra time if you have to make more than one stop! I got my copy, and it cost me $9. It should have been less, but the copy I wanted and the one she thought was better were two different things. I ended up having a lot of excess, so that was a bummer. I had my dimensions, gave them to Miss Grumpy, but she wasn't a good listener either. Next came the vintage, aged look for the paper. 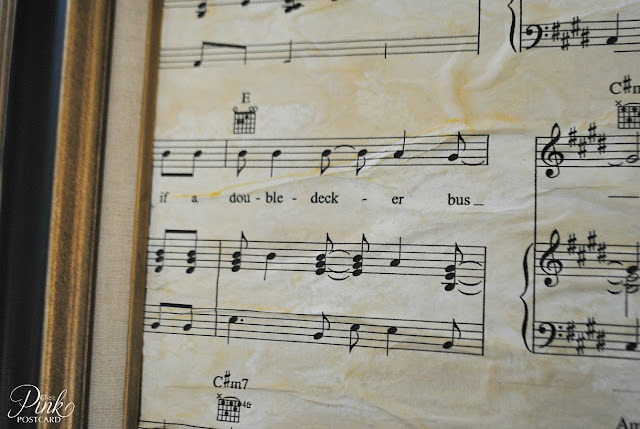 Once I had the sheet music at home, I laid it out on the deck. 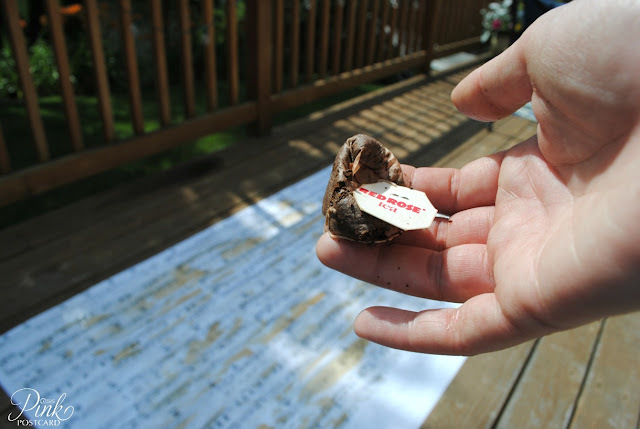 It was a nice, warm, summer day, and our deck is going to be stained soon, so I wasn't worried about the tea stains on the wood. I brewed a tea bag, let it cool, and then began to paint the paper with the tea bag. Because I let it sit so long, the bag eventually disintegrated, so I used a paper towel to finish up the last bit. As you can see from the photo, I went pretty heavy with the tea, let it sit for a few minutes and then wiped all the puddles with the paper towel. It dried in the sun pretty quickly. Because Jon sometimes works from home, I don't have any photos of me cutting it out- there was a moment of panic just after cutting it out when - SURPRISE!- daddy was home!! He didn't see it, thank goodness, but basically, I just measured the area of the canvas inside the frame, cut out the section of music that I wanted, and poured Mod Podge right over the canvas. I smoothed out the Mod Podge into a thin layer all over with a foam brush. Then, I layed out the music and began smoothing it in sections with my hands. It was wrinkly, but that's the look I was going for. 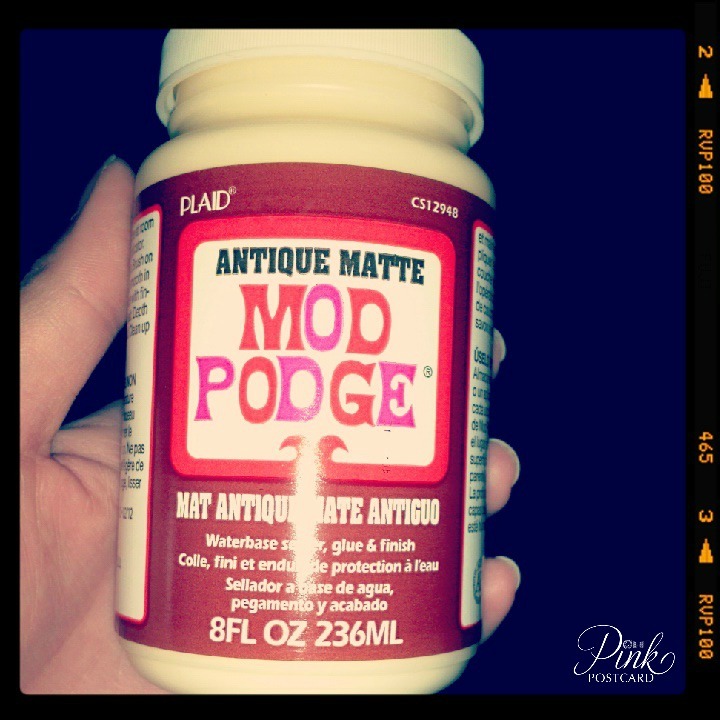 I also was running low on Mod Podge, and found a cool 'new to me' version. It has a golden tone to it, so it also enhanced the vintage look I was going for! Once the music was in place and dry (I let it sit overnight) I went over the top of it with the Antique Matte, and let it dry. Since this was so large, I obviously did not take this with us to Maui. I just took photos of it before we left, and then showed it to him during our card / gift exchange at dinner. The song I had printed out for him was The Smith's, "There Is A Light That Never Goes Out". We've loved it since college. We always cheeseball and googly eye at each other the line, "if a double decker bus, crashes into us, to die by your side, the pleasure the privilege is mine." and is one that has had a lot of sentimental meaning to us for 20+ years. 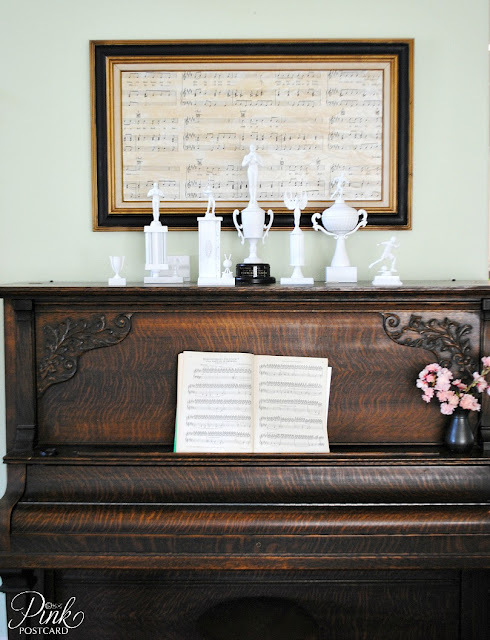 We hung it up yesterday over the piano, and it makes us smile! A wonderfully romantic, creative gift that has a lot of meaning to us. Thank you so much to Jesse for giving me the inspiration to do our own version! I loved reading your post, and liked finding out about you and your hubs love for each other, and the significance of the song! What a thoughtful gift you gave him, and how helped you create another memory. Very touching story! So glad you shared your creative inspiration with Sunday’s Best – your creativity helped make the party a success! Oh that is perfect!! You did a wonderful job on that, and now have inspired me to do something similar!! I bet your husband was and will always be proud of your talent on this project. What a great idea for an anniversary present!! Your directions/tutorial was easy to follow too, but I'll go and check out that pinterest pin too so I'll get it right. As a music lover myself, that really gave me a whole lot of ideas now! Thanks so much for sharing your anniversary gift and private meaning with us. I love how that made the music so special! ooooh I love this !!! 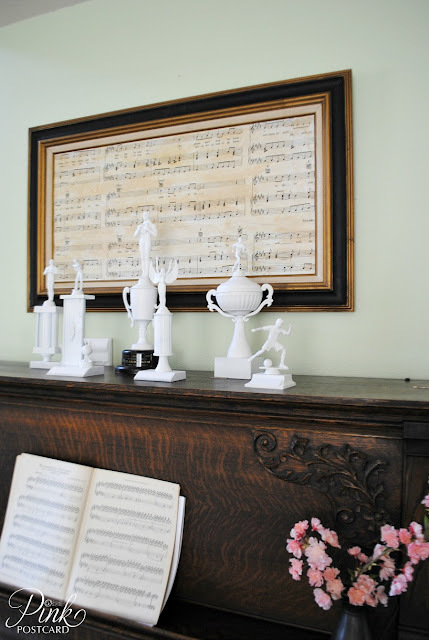 Your husbands gift turned out great and I love how it looks over the piano with the white trophies! This is AWESOME - love it!! Gorgeous! It looks stunning hung above your old lovely piano. When you say that you cut the music into strips and "pieced it together", what do you mean? Did you use tape to keep them together to create one large piece of paper, and then bring it to Kinkos to be copied? Hello! I plan on doing this this weekend. I have a couple of questions about it though. 1: I have the same question at Calvin Nurge above - did you piece it all to one piece of 8 1/2 by 11 paper? 2. What size did you have this enlarged to when you took it to the print shop? 3. when you say you had a lot of "excess", does that mean the white space at the bottom of the print? I tried doing this last year and had two large white sections on either side of the print - staples couldn't have my music extend the full way across and I can't figure out how to fix it! 4. When you say "cutting it out" How much bigger was your print to your frame? did you feel you lost quite a bit of the actual music? sorry I am just now responding to some of the questions. Older posts go to my archive, so I don't always see them right away! 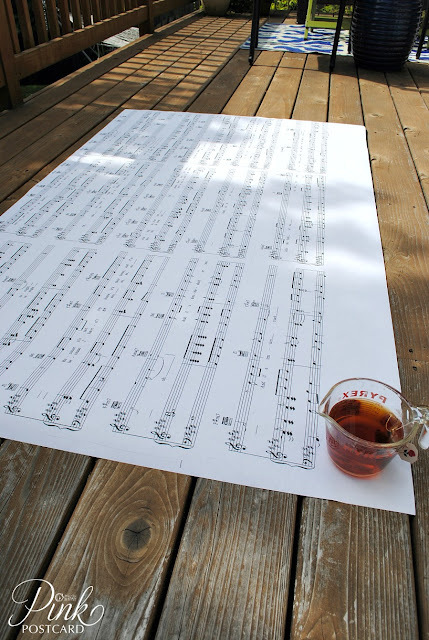 As far as constructing the pieces of sheet music to copy, I trimmed away all the white edge of the 8 1/2 x 11 sheets. They were then taped together on the back side, so that when it's photo copied large scale, the bars of music all line up. You want to have the music looking seamless, rather than white spaces breaking up the bars of music.